The truth about our overconsumption of industrialised food has brought stark realities to the fore. That the livestock we (eventually) eat produces more greenhouse gases than the cars we drive, and that it takes about 2,400 litres of water to produce a typical hamburger, are among the most astounding facts of this era of growing environmental awareness. But what if we don’t eat it? Indeed, we waste almost as much food as we consume and the energy that goes into growing, storing, processing, distributing and then discarding it produces an alarming amount of CO2 – not to mention the energy used if that food is cooked. In a 2013 Food and Agriculture Organization (FAO) report, it was calculated that 54 per cent of global food wastage occurs during production, post-harvest handling and storage, and 46 per cent at the processing, distribution and consumption stages. The carbon footprint of food produced but not eaten is estimated at 3.3 Gigatons of CO2 equivalent. As such, food wastage ranks as the third top CO2 emitter after the USA and China. The report goes on to say that “the total amount of food wastage in 2007 occupied almost 1.4 billion hectares, equal to about 28 per cent of the world’s agricultural land area” – second only to the total land area of the Russian Federation. A report in the same year by the UK’s Institution of Mechanical Engineers found that between 30 per cent and 50 per cent of food produced around the world never makes it to the plate. Another way that industrial farming influences the ocean is the effect that animal waste has on aquatic life. The enormous scale of industrial farming means an exorbitant amount of nitrogen from animal waste reaches our waterways and oceans, encouraging disease and destructive algal blooms. These blooms use up oxygen in the water, contributing to “dead zones” where there is not enough oxygen to support aquatic life – an example of such in the Gulf of Mexico stretched over 1,200 square kilometres during the summer of 2010. Add hormones and chemically modified feed, and the oceans suffer further. Each and every one of us has the ability to mitigate these threats by choosing what food we eat and how we consume it; as representatives of the high-end travel industry, we have not only the opportunity, but also the responsibility to think more carefully about the food we serve. That’s why at PURE 2016, when we asked PUREists to make one small promise that can Change Worlds, many pledged to take steps towards reducing food wastage, as well as cooking and eating locally produced, seasonal food when possible. One person might not be able to impact the fate of the planet, but together we can create enormous positive change. Previously a freelance journalist and editor of Africa Geographic, Anton Crone is CEO of Safarious, an online travel portal to the world’s wild places. Anton not only focuses on wildlife, he also finds himself drawn to the people he meets on his travels. 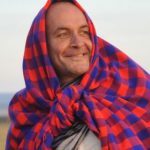 He looks at journalism as a way to connect people of differing creeds and cultures, and through his writing and photography he tries to uphold the importance of the communities that live side by side with wildlife.